So, after thinking about it for the last 24 hours, I’ve decided to release the a chapter of Breaching Blue every day this week. Enjoy. And, if you don’t enjoy, blame Shiffman. Tornus examined her new home. She had claimed the highest vantage, the last cavern below the sunbreak, so she could watch her sisters moving across the reef. The mountainous coral atoll continued, transecting the sunbreak and climbing into the illuminated ocean. She could see traces of even more caverns extending towards the surface, caverns that opened into the sunlit waters. She felt dizzy, staring up at the radiant corals above. Her eyes prefered the darkness. The reef offered protection, but only so much. The darkness, where she could sense danger as a wave through her body, where her massive eyes could see what others could not, where she could darken the pigments of her skin until she vanished into the abyssal backdrop, those offered her the greater protection. The fiercest hunters–blackfish, pilot whales, and beast much larger–waited beyond the sunbreak. Inexplicably, the caverns grew in size as they climbed the reef. Those at the base were tiny, some so small that none among her kin could squeeze through the entrance, while those near the sunbreak were wide and deep, carved for the broad shoulders of her stouter kin. .
Tornus chose the largest cavern she could find. Hers was far grander than her sisters’, with a spacious entrance, wide enough to swim comfortably through at full speed, fins extended and tail pounding. It opened upward, rather than outward, and she practiced diving into it, beating a path of bioluminescent froth in her wake, imagining desperate predators giving chase. The chamber was enormous. It could accommodate a dozen of her kin, should she ever choose to welcome others into her home, yet it was surprisingly bare. There were no carvings decorating the walls. The great bowled floor was buried under layers of sediment, deposited over uncounted seasons. Tornus circle the room, beating her tail against the well-worn floor, raising a cloud of silt that she methodically forced from her new home. Finally, the room was clear. As in other caverns, a wide, shallow bowl was ground to a near-flawless polish, the result of generations of scaled tails abrading the floor as they slept. This floor was different, it wasn’t just polished limestone. As she circled the room, the last rays of light pushed through the edge of the sunbreak, imperceptible to creatures that lacked her refined eyes, but just strong enough to set the floor alight. Tornus gasped. The light arched through the room, bending against the polished walls, igniting every crevice with dazzling color. The floor was inlaid with pearlescent shells, collected from the massive clams scattered throughout the upper edges of the reef, above the sunbreak. Each shell had been carefully shaped, tiny fragments of a perfectly aligned mosaic that wrapped around her chamber. The mother-of-pearl criss-crossed the room, reflecting and bending the few dedicated rays of light that had reached the very edge of the illuminated ocean, filling the room, inconceivably, with a ghostly inner light. The ethereal patterns lovingly laid into the floor were not simply decorative. Tornus’s eyes adjusted to the light as she traced the lines that defined the sleeping bowl, that rose in parallel arcs towards the entrance, like the delicate test of a sea urchin. The lines converged on a section of wall above the sleeping bowl, close enough to the entrance that, without the aid of the illuminated mosaic, the image would remain invisible. In the light cast by the sun and amplified by the curved mirror below, Tornus could see a pair of almost perfect handprints carved not in pearl, but a different material, mottled, brown, and glistening, the shell of a hawksbill turtle. The prints called to her. They demanded her. They wanted her to reach out with her own hands, a perfect fit, and push. The wall rose slightly, then gracefully fell away, nestling into a coralline cradle beneath the exposed passageway. The smoothed edges and slight lip that held it in place were crafted such that only a precise nudge with the right set of appendages could dislodge it. Another puzzle meant only for Tornus and her kin. Tornus peered down into the void. Behind the wall was a great, long tunnel. It dropped into the bowels of the reef, the center of a massive, mer-made structure. Tornus hesitated. Her place was with her sisters. Together they had survived the great drift. It seemed so long ago, now. The distant past was slowly fading, though she knew only a few days had passed since their arrival. How had they come to this place? Her memories were already so hazy. We drifted, she thought to herself, but we couldn’t swim. She drew her tail up to her chest and wrapped her arms around it. When did this come from? Was it with me the whole time? No, she finally decided. The tail came later. But how much later? As Tornus stared into the dark cavern, she thought back to the drift. How many of us were there? Thousands? Millions? How did we come to be so few? We clung to each other, she looked at the strong arms still grasping her tail, but not with these arms, not with these hands. And then, at last, the biggest revelation, what were we before? Tornus was dizzy. The passageway begged uncomfortable questions. Even her thoughts were suddenly alien to her. They were barely more than instinct when she arrived at the reef. Protect my kin. Hide from predators. Don’t get complacent. This place is good. That place is bad. In the days since they arrived on the reef, her thoughts had become more complex. Her mind was taking form. For a moment, Tornus pondered diving down, into the void, to see just how deep it went, to find what was waiting for her at the bottom. But she couldn’t. She was painfully aware of how far she was from her sisters, how long she had been alone. She didn’t like it. She didn’t like being being separated from her kin. That’s how they survived the drift. She didn’t let go then, and she wouldn’t now. Without looking back, Tornus darted back out through the entrance and rejoined her sisters on the sandy bottom below. If you can’t wait until the next novel is finished, check out some of my other maritime science fiction adventures. Or your could just follow me on twitter, where I mostly make bad fish puns. 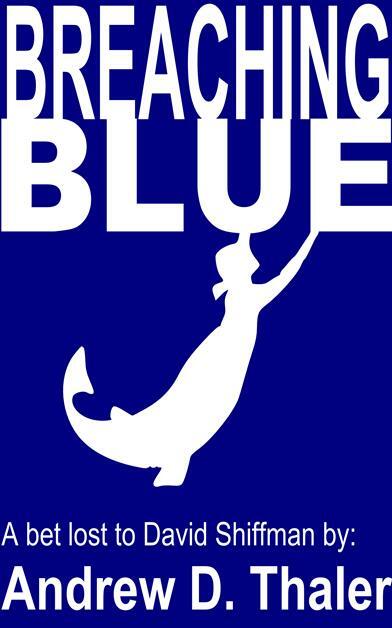 Breaching Blue: Because Mermaids are the new Vampires.